If you’re wondering whether or not it’s worth taking a boat trip from Ibiza to Formentera for the day, the answer is YES! Rosana and I almost didn’t go. We were having such a great time exploring Ibiza and we didn’t feel like getting up early to catch the ferry. But I’m so glad we did as it turned out to be one of the main highlights of our trip. 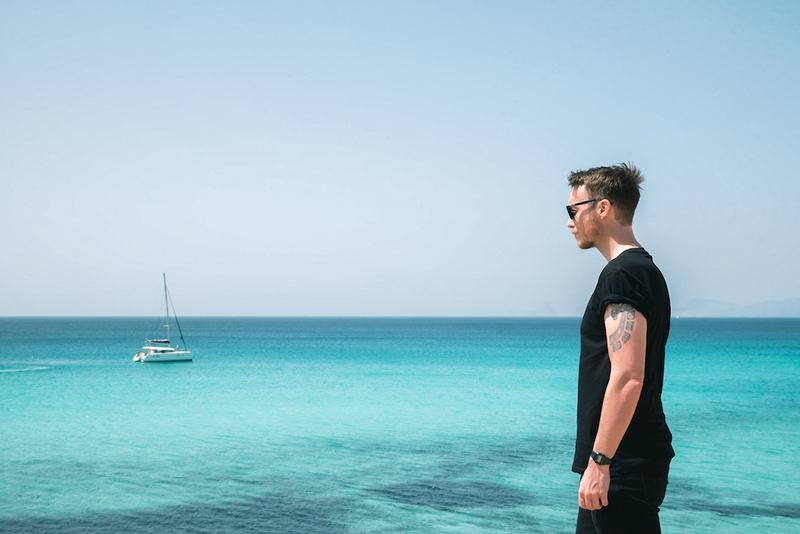 What do you know about Formentera? 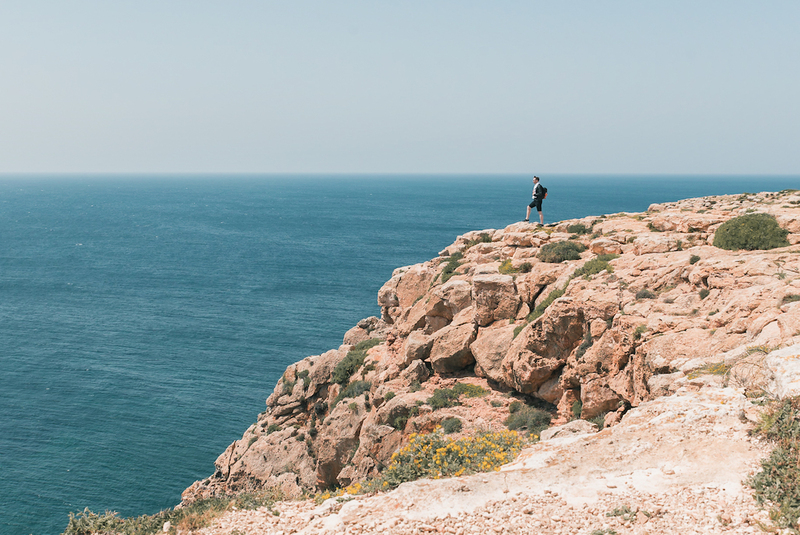 Located just five miles off the coast of Ibiza, the flat and craggy outcrop of Formentera is the smallest and most natural of the Balearic Islands (which also include Ibiza, Mallorca, Menorca). When I say small, I mean you could literally see the entire island in just one day – on a bicycle! Less than 20km from tip to toe. And when I say it’s the most beautiful and natural of the Balearic Islands, I mean it’s almost entirely undeveloped. Unsurprisingly, it has long been something of a mecca for nature lovers and naked hippies. Rosana has some friends who lived in one of the island’s caves for three months. Apparently they never once wore clothes. Words, photos & video by your island hopping guide, Ben Holbrook. 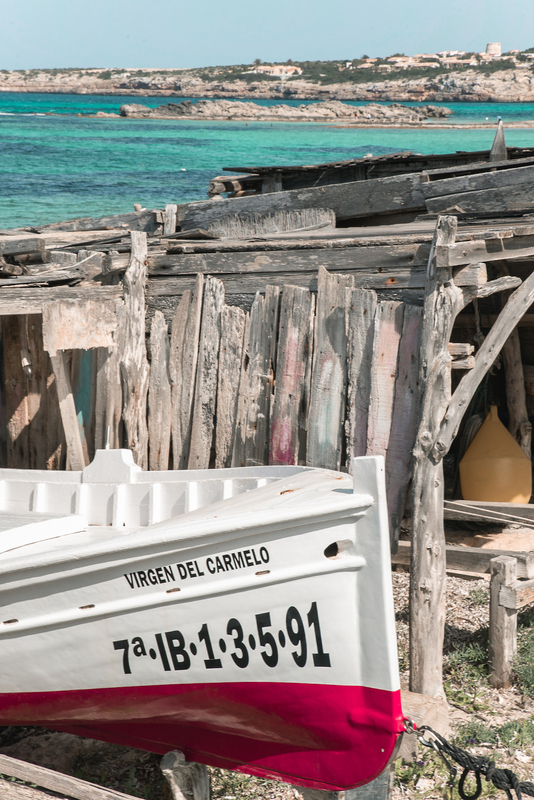 Formentera is a fantastic example of where responsible tourism really works. Strong environmental ethics lie at the heart the island’s council, with strict construction controls and but a handful of hotels (definitely try to stay overnight if you have the time). There were many moments as we zig-zagged giddily across the island on our little rental scooter where we found ourselves entirely alone. It felt very much like a deserted tropical island. 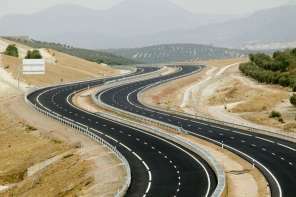 Narrow roads and tracks traverse the vast expanses of shrub-filled land in unusually straight lines. Seemingly every road leads to a stretch of bleached-white sands, to pristine waters that glow with deep hues of azure and luminous turquoise that don’t quite seem real. I’m not at all surprised to hear that Joni Mitchell wrote her 1971 album Blue on the island. In contrast, other parts of the island are a tumble of rusty red rocks, like a martian meteorite adrift in the Med. Turquoise waters and Mars-red rocks at Cala Saona. 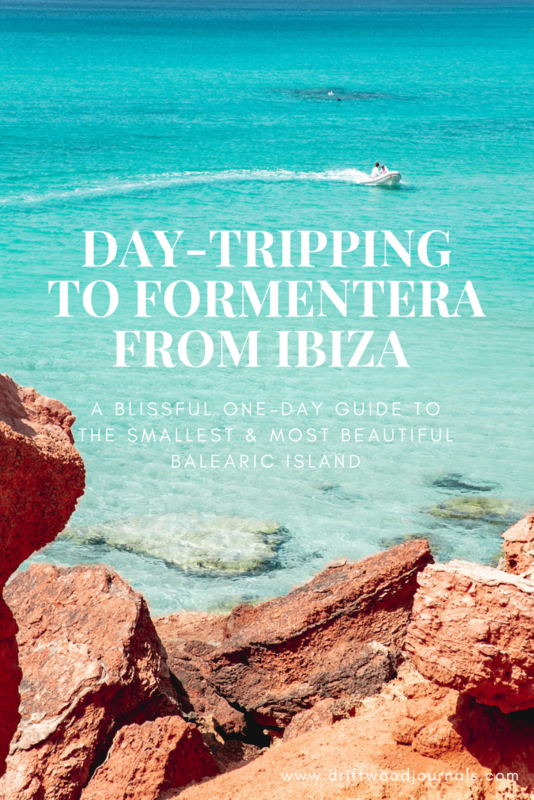 So if like us you are planning a trip to Ibiza (see my “couple’s guide to Ibiza“) and wondering whether or not it’s worth spending the time and money to go to Formentera for the day – you definitely should! 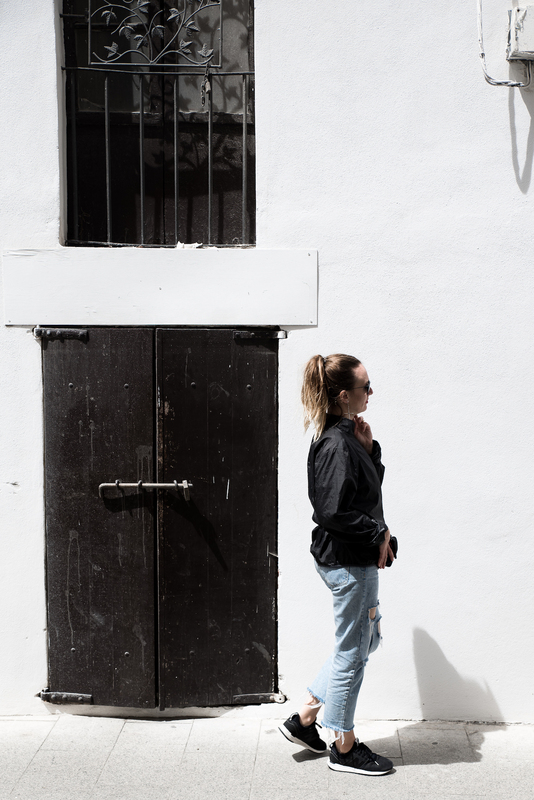 Here are my tips on everything from exploring Formentera’s must-see sights and most beautiful beaches to getting around the island and finding restaurants where you won’t get get ripped off – my very personal guide to the best things to see and do in Formentera. 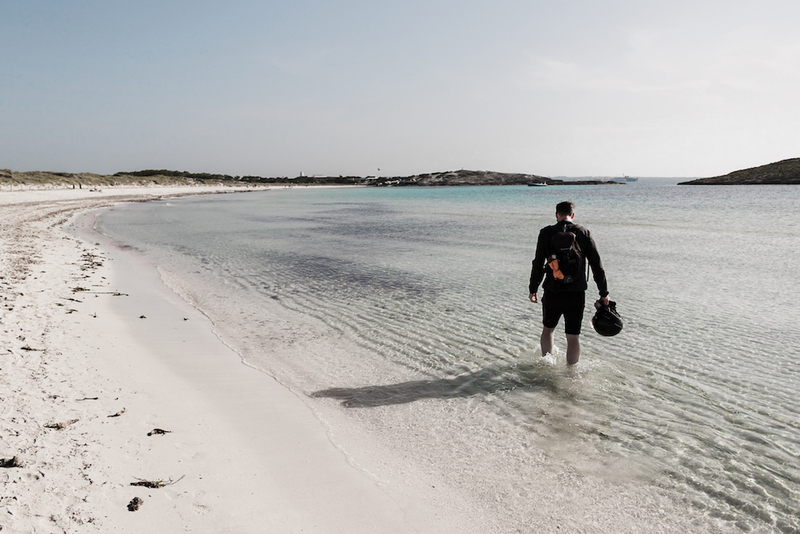 Located on the most southerly tip, Cap de Barbaria takes up a large chunk of Formentera and was home to the island’s first inhabitants some four thousand years ago. During the island’s repopulation in the late 17th century, most of the area was reserved for Spanish royalty, resulting in place names like Camí del Rei (King’s Road) and Pla del Rei (King’s Plain). 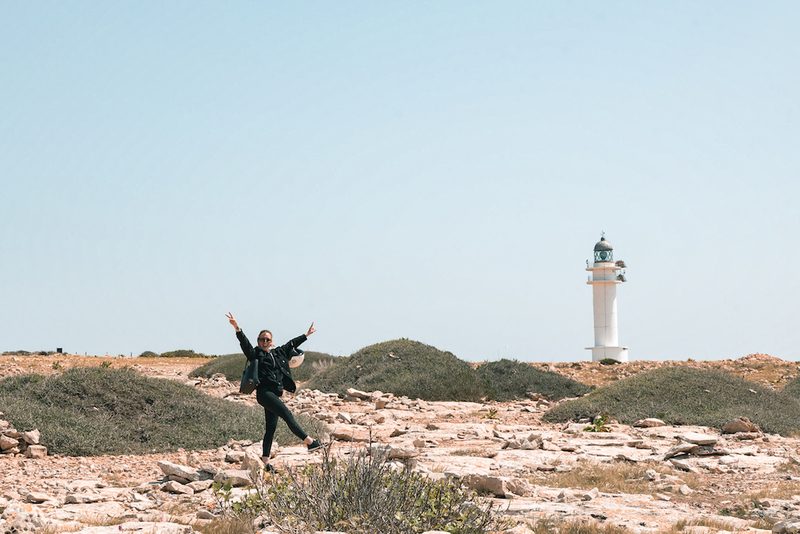 Cap de Barbaria is also home to Formentera’s most recognisable icon, the Faro Cap de Barbaria (lighthouse), which looms over the craggy cliffs and wind-swept shrubs below. Find a rock to sit on and watch the birds swoop and dive above you. 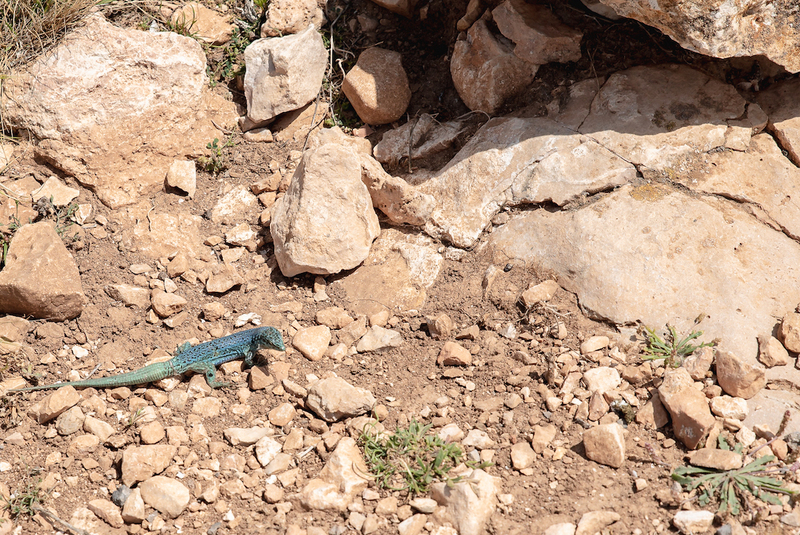 Keep your eyes peeled for the little green and blue lizards that call the headland home. Some say that Bob Dylan rented the lighthouse back in 1968 so he could spend the winter on the island. Others say he stayed in one of the windmills. Either way, he would have been there when the ships came in. 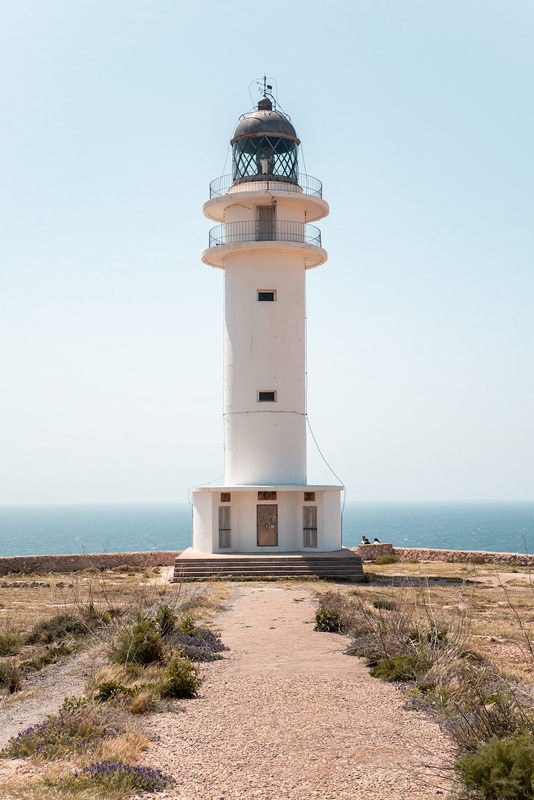 Tip: It’s also worth visiting La Mola lighthouse, which is often referred to as the ‘lighthouse at the end of the world’. The structure itself isn’t quite as impressive, but its elevated, cliffside location is sure to take your breath away. The bay of Saona is sheltered by cliffs of burnt-terracotta rock and fragrant forests of pine. This was my first introduction to the island’s impossibly translucent waters. It was a blissful state of mind I will never forget. Friends flock together – at Cala Saona. Here you’ll also find a little chiringuito (beach bar) serving great tapas and cold drinks. It’s also home to the 4* Cala Saona Hotel & Spa, which is unquestionably one of the most desirable hotels on the island. 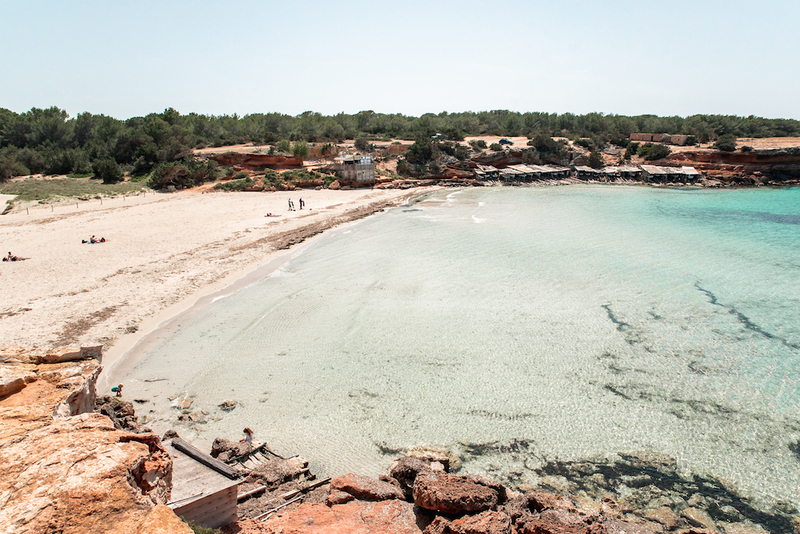 Tip: Cala Saona faces west so this is a great place to be for a little tipple at sunset! Fishing village vibes at Es Pujols. Es Pujols is the island’s historic fishing village, a laid-back “resort” where looming palm trees sway in the breeze and cast spindly shadows over the fine white sands. Es Pujols is the most built up area on the island, with a number of little bars, restaurants, hippy stalls and shops to explore. We grabbed some ice creams and just sat on the beach for an hour or so to soak it all in. Es Pujols is also where you’ll find most of the hotels on the island. Tip: Formentera’s nightlife is concentrated here in the narrow backstreets of Es Pujols. Be sure to get dressed up for the “Flow Power” and “Piratas” themed parties. Club Tipic is the oldest and most established party spot on the island – famous for staging Pink Floyd back in 1971. 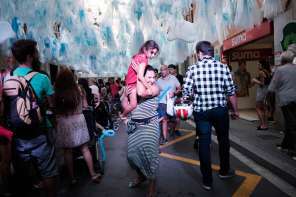 Other happening places to fiesta include Pineta Club, Pachanka Music Club, and The Beach Formentera. 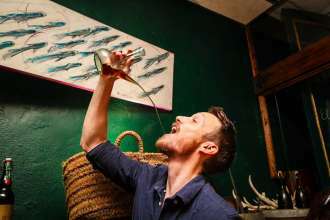 Kickstart your evening with cocktails at Neroopaco. Formentera’s strategic location on the oriental shipping route made the island a prime target for pirate invasions for many hundreds of years. Barbary pirates attacked so often that the island was uninhabitable from 1403 to the early 18th century. As well as setting up camp on the island and storing their loot in its many caves, the pirates also pillaged and plundered their way through the local community, even capturing the natives and selling them into slavery. Basking in the sun with one of the locals. The locals eventually took action and built a series of watchtowers. As well as being armed with powerful canons and acting as impenetrable boltholes capable of safeguarding up to 200 people, they were also used to warn the local population of incoming pirate attacks. If a guard spotted danger, they would light a fire on top of their watchtower. The fire and smoke would warn the next watchtower teams, who would do the same, ensuring everyone on the island had time to prepare. Tapas lunch at Sa Palmera in in Es Pujols. 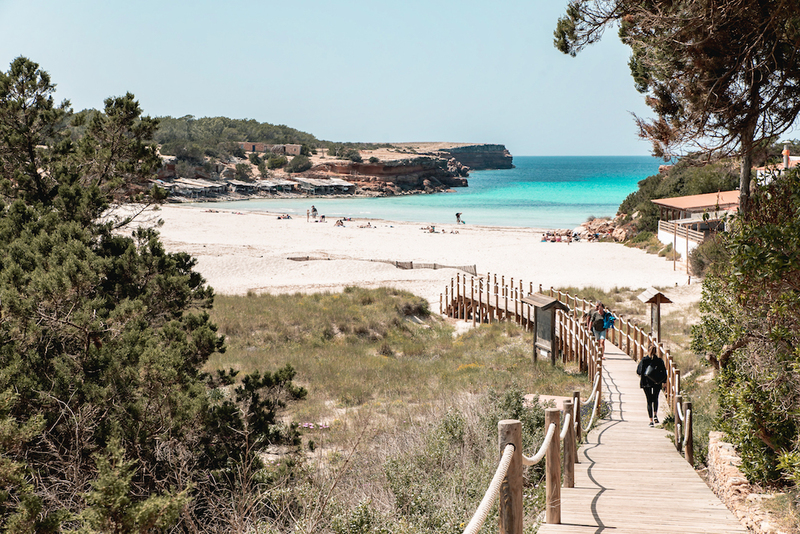 Hugging the beach of Es Pujols is a sandy boardwalk offering views over the luminous aqua waters. 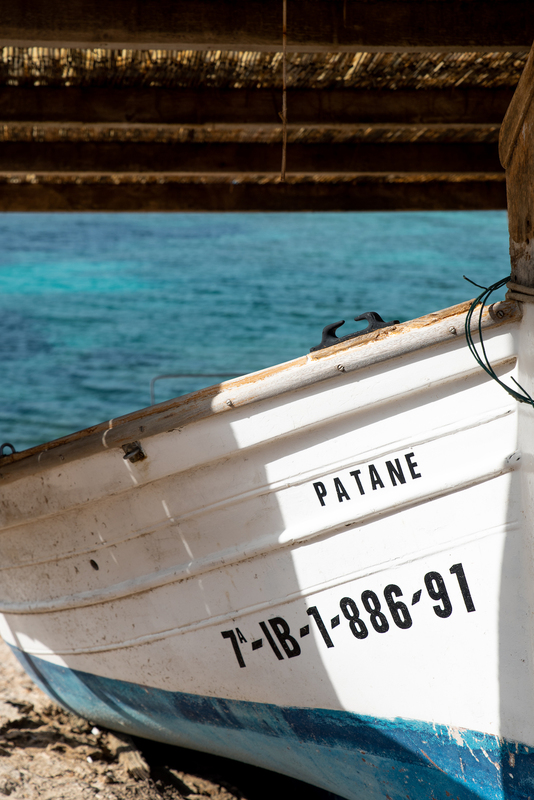 Wooden fishing boats called ‘Bon dia’ and ‘Patane’ can be seen winched up on the beach, laid to rest in rickety little shanties. We followed the bay to a casual little beachfront restaurant called Sa Palmera. We’d heard such awful things about eating on Formentera, about everything being overpriced, but the prices here were more than reasonable. 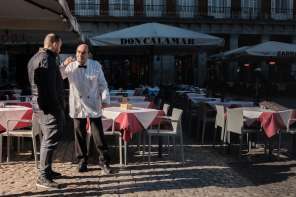 Assured by the presence of locals devouring giant platters of marisco (seafood), we plonked ourselves down on the terrace to sip ice cold beers and load up on traditional Spanish tortilla (omelette). For me, Spain is all about the simple things. Es Arenals for fresh seafood and paella on the beach, or the trendy Can Carlos in the capital of Sant Francesc Xavier for Mediterranean cuisine and cocktails. 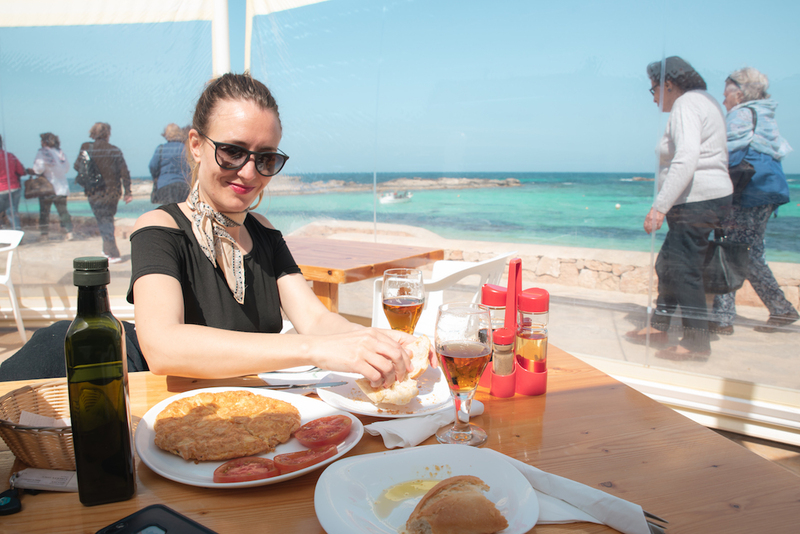 Juan y Andrea’s chiringuito on Platja Illetes started life as little more than a shack on the beach but is now one of the best places to eat with your toes in the sand – try their excellent Formentera gambas a la plancha (grilled prawns). Pequena Isla (Little Island) is a great family-run restaurant serving traditional local dishes, including seafood, rabbit with onion Formentera’s signature ‘ensalada payesa‘ salad (salad) of boiled potatoes with bacalao (salted cod) and chargrilled peppers. 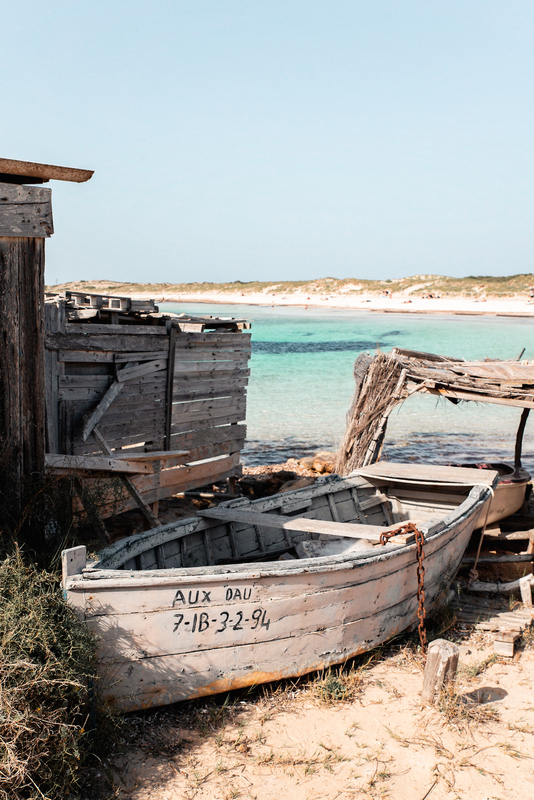 Tip: Formentera’s salt industry made a big impact on the island’s cuisine. Be sure to order any type of dried or salted fish (‘peix sec’) you see on the menu. You’ve seen the photos and heard everyone raving about it, now it’s time to experience paradise for yourself. 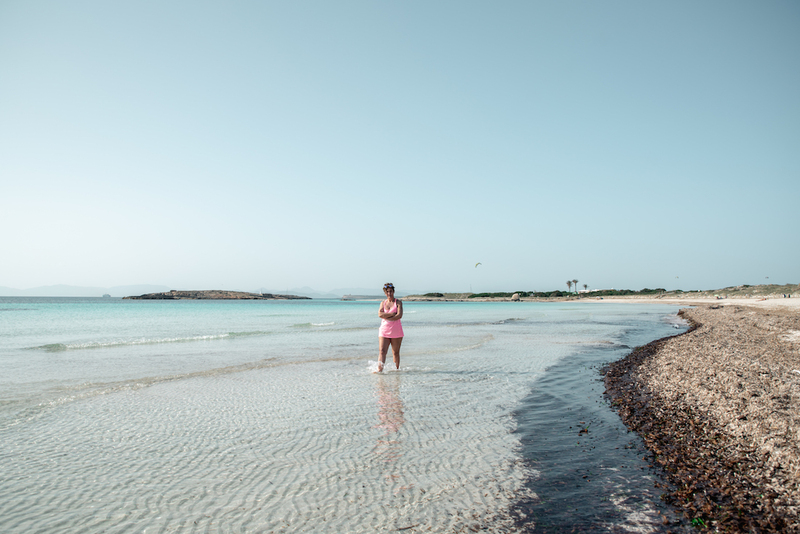 Playa Des Illettes is the place to see Formentera’s crystal clear waters and ivory sands. Take a little picnic with you and spend a few hours’ soaking up some rays and bathing in the translucent waters. This is where you’ll want your camera handy! Tip: The Kiosko Pirata is tempting with its reggae-reggae vibes and Jolly Roger flag, but I’ve heard horror stories of perilous prices and scallywag service. It’s a fine spot for a beer, but maybe head elsewhere to eat. The Ses Salines Natural Park covers an impressive expanse of land, including the Es Trucadors peninsular and its surrounding waters up to the Estany Pudent. The naturally high concentration of salt here is what spurred on the island’s salt industry and you can still see the vast salt pools. Keep an eye out for rare species of birds and marine life. The charming whitewashed village of Sant Francesc Xavier is the capital of Formentera, the island’s physical and cultural heart. In fact, it’s more of a fortress than a church, with thick walls and a vaulted, canon-equipped roof capable of withstanding even most barbaric of pirate attacks. And this was the original purpose of the church, to act much like the watchtowers should any pirates come marauding through the community. 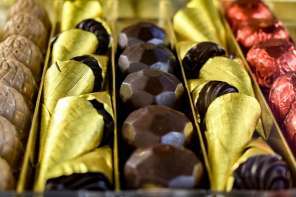 You’ll also find a few great little tapas bars, shops and a market. 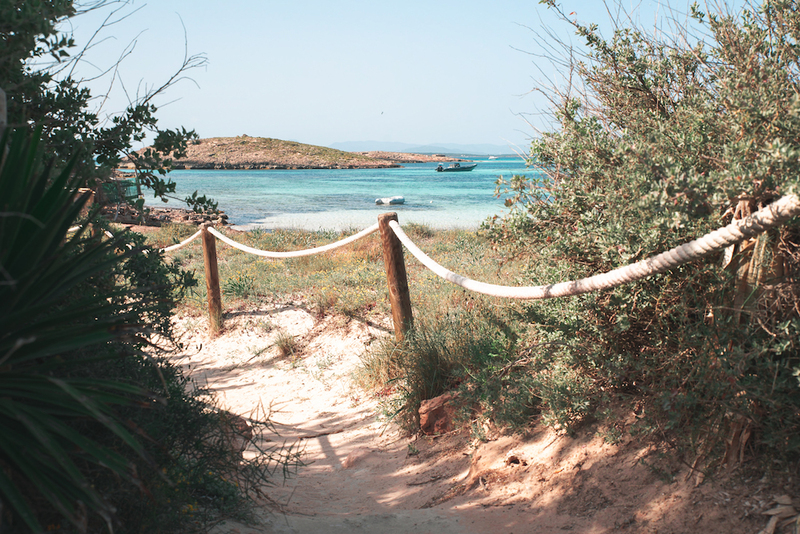 Formentera is beautiful at any time of year but be aware that temperatures soar between July and August, making it too hot to explore the hiking/biking trails. Also note that most of the island’s tourism-related business close for the off-season from November–April. The ferry time from Ibiza to Formentera is about 45 minutes, with hourly departures from the dedicated Ibiza-Formentera ferry port. 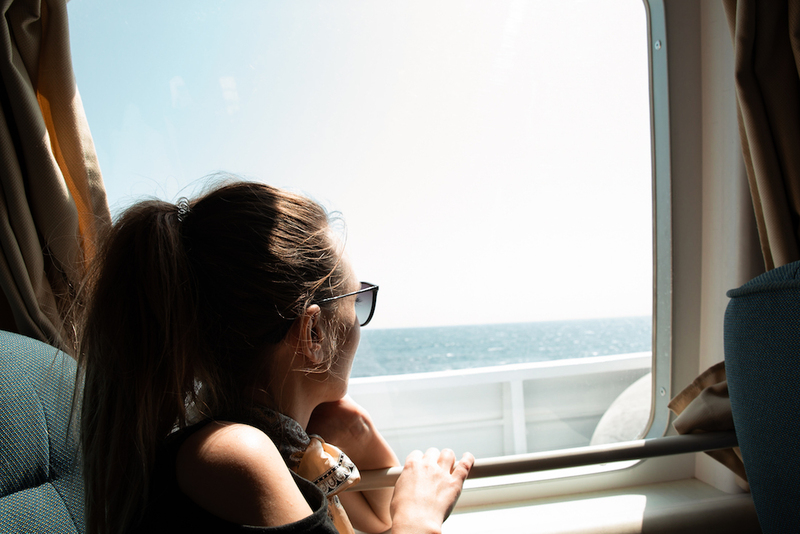 You can turn up at the ferry port and buy your tickets before boarding, but there are strict limits on how many passengers can travel per boat so you might want to book your tickets ahead of time – which can also work out cheaper. We didn’t book ahead and it was quite a stressful start to the day. The Aquabus is a great option with tickets from only €20 per person. You can board at the Port of Ibiza, Figueretas Beach or Playa d’en Bossa. As soon as you step off the ferry in Formentera you will find a row of little booths offering all sorts of rental vehicles (and bicycles). 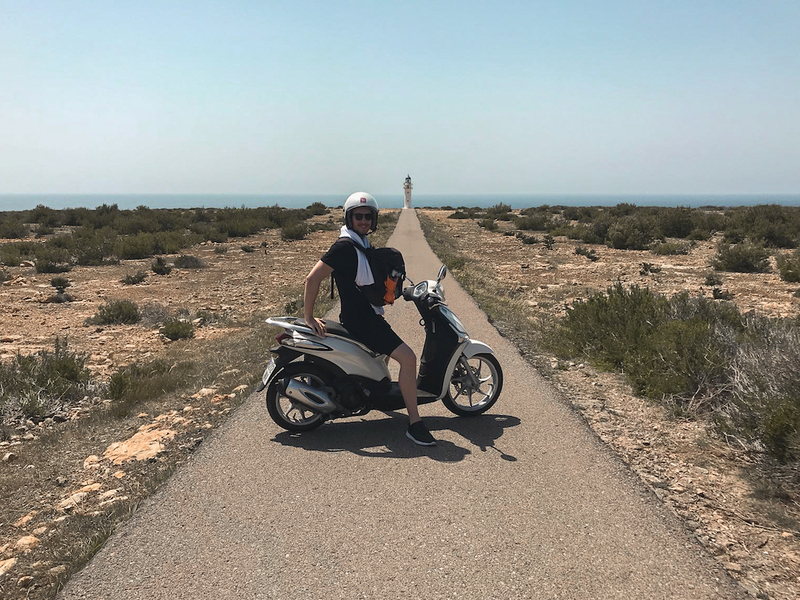 By car or scooter: You can rent a 4×4 Jeep or a small car, but my personal recommendation would be to explore Formentera on a scooter. The roads are extremely straight, quiet and easy to navigate – and it’s just more of a proper adventure on two wheels. You can rent a scooter once you get there although you might prefer to book your scooter ahead of time. By bicycle: If you’re organised and get to the island early enough then I would also recommend cycling around Formentera. There are some 30 relatively flat ‘Green Routes’ on the island that allow cyclists to get off the beaten track, although you’ll need to be relatively fit and used to cycling to see everything in one day. It’s also the most eco-friendly and sustainable way to get around – this is how I would choose to see the island if I were staying for a night or two. 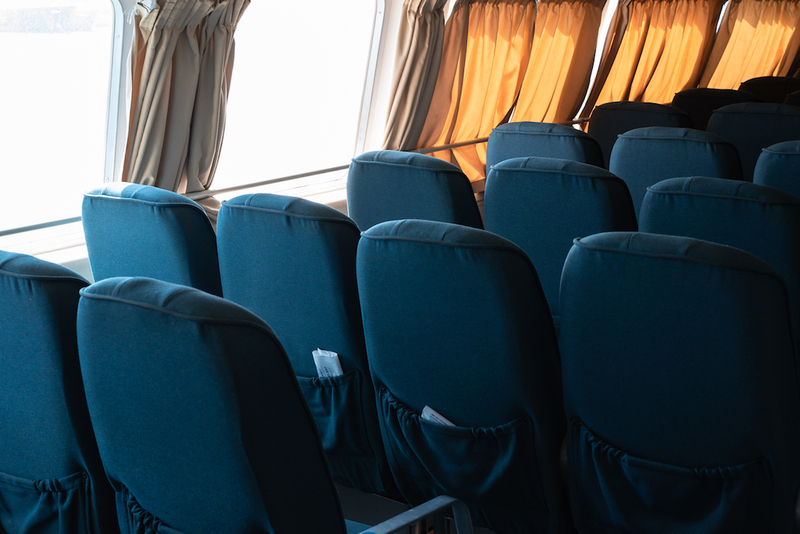 Guided bus tour: This is the most stress-free/comfortable option. 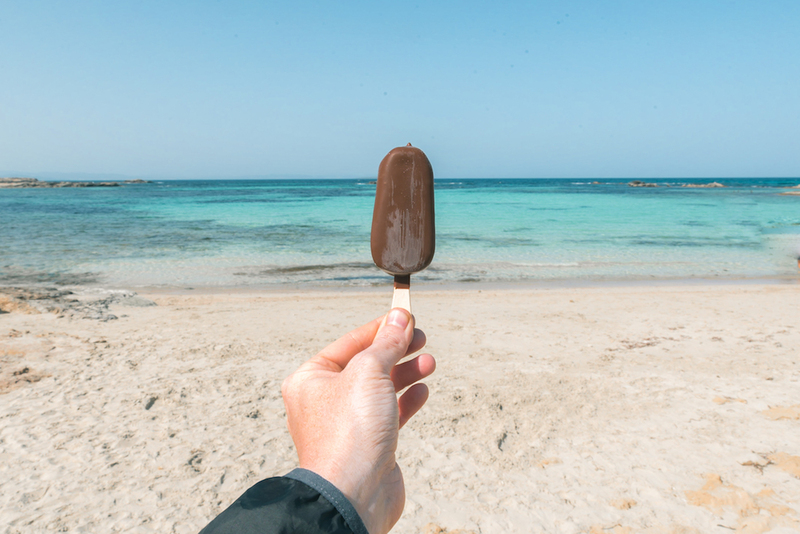 The €70 ticket includes pick-up from your hotel, the ferry ride from Ibiza to Formentera and a guided bus tour of Formentera’s most essential sights, viewpoints and beaches, with free time for lunch and swimming at Las Salinas beach. Budget Accommodation on Formentera: Check out the fantastic 1-star Sol y Mar or Hostal Capri if you’re travelling on a budget but still want to be located within strolling distance of the beach. 2 and 3 Star Hotels on Formentera: Hotel Maysi and Hotel Rosamar are excellent 2-star options close to beaches, restaurants and nightlife. Hotel Sa Volta is a gorgeous family-run 3-star property with a rooftop pool and terrace overlooking the sea. 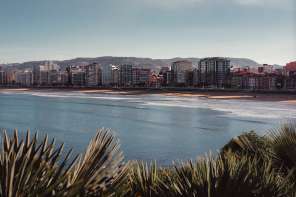 Hotel Levante is another excellent 3-star option. 4 and 5 Star Hotels on Formentera: Blanco Hotel Formentera is one of the highest rated luxury hotels in Formentera, with easy access to the beach, restaurant, shops and nightlife of Es Pujols. Hotel Cala Saona & Spa is another superb option if you’re looking for a little luxury and want to be near the idyllic Cala Saona. The Punta Rasa Formentera Apartments offer great value for money and are great if you’re travelling on a budget but still want your own apartment. The S’Olivera Apartment complex has its own swimming pool and is located just 5-minutes away from Es Pujols on foot. Great for families and/or couples who want to be within stumbling distance from the beach and nightlife. Can Angel is a cute little bungalow (one-story house) in Sant Francesc Xavier with a fantastic outdoor terrace area. Two bedrooms with space for for. Great value for couples or small families. If they don’t have availability then Vivendes Adelina is another great option. ~ Formentera is home to the planet’s oldest living organism. Posidonia is a sort of seagrass that acts like a protective coral reef and is thought to be around 200,000 years old. ~ Flamingos migrate to the Ses Salines Nature Reserve from August to October. You can see them in all their glory at the Estany Pudent (‘Stinky Pond’), which is Formentera’s largest salt lake. 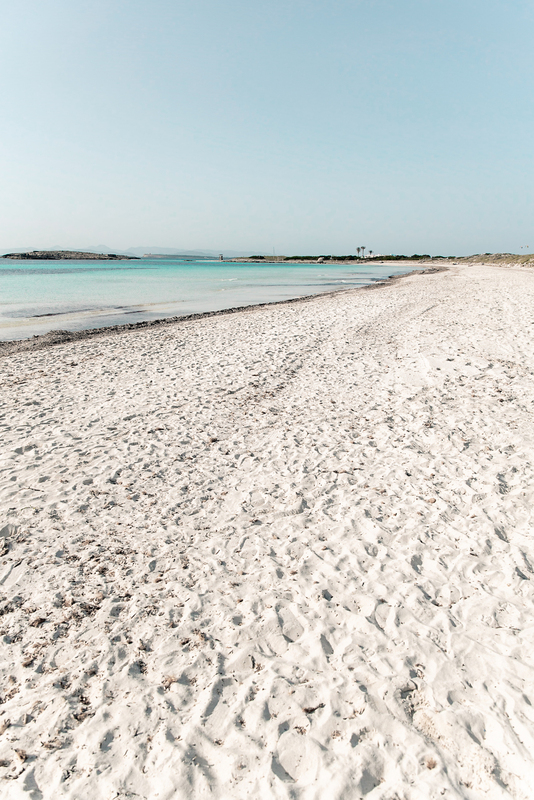 ~ Formentera was once sustained by its salt flats. You can delve in this world and see the old harvesting machinery at the Ethnological Museum (entry is free). Got a question? Did I leave something off this list? Please leave a comment below and let me know! And be sure to join me on Facebook, Instagram, Twitter and Youtube for more travel advice and inspiration from Spain and beyond.